These are the best times when you have a good paddle, sitting on the beach and watching the misty rain move in just after you got off the water. 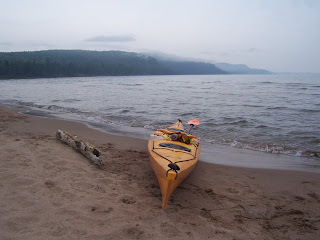 The photo was taken in the Keewenaw Peninsula, which I think is one of the best paddling destinations in Michigan. The scenery is wonderful, rocky shore lines and mountains to see. The access is good, and there are many protected bays to paddle when Lake Superior kicks up. There are also inland lakes worth paddling.